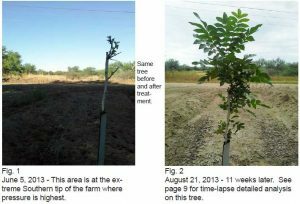 This established pecan farm inter-planted approximately 15,000 young trees on 600 acres where 60’ x 60’ spacing had originally been used. Shortly after planting, herds of deer began to cause significant damage to the young trees. Facing the prospect of unacceptable damage and mortality, the grower contacted Tree World and acquired enough of the deer repellent Plantskydd powder concentrate to spray 331 acres of the newly planted trees. Damage to the trees was dramatically reduced immediately after the first application of Plantskydd and complete control was achieved once adequate coverage was achieved. By the end of summer, browse damage from deer was virtually eliminated. 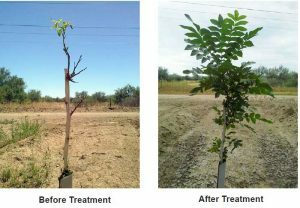 Young Pecan trees require only a short period of a few years to grow past deer damage, ruling out fencing as an economical option. In the past, a contingency plan included the use of another deer repellent: a capsaicin-based animal repellent commonly used in agriculture. Once significant browse damage began, the capsaicin product was sprayed 2 times but the deer resumed heavy browsing after only a few days. The farm is in the Southwest U.S. desert climate zone with an average June rainfall of less than ¼” and the fields are flood irrigated, so it cannot be said that the capsaicin-based product was washed off the plants. These same conditions create an ideal situation for the deer with irrigated, nutritious young trees and grasses for food, shade and cover from the sun thanks to the mature trees and presumably fewer predators due to the human presence. Other than a ¾ mile buffer of residences on one side and pockets of dwellings on the other, the farm is literally surrounded by hundreds of miles of wilderness.